ROME, 5 July 2018 (FAO)* – Traditional ginseng farming in the Republic of Korea and olive tree groves in Italy’s Umbria region have been recognized on the register of Globally Important Agricultural Heritage Systems (GIAHS), managed by the UN Food and Agriculture Organization (FAO). 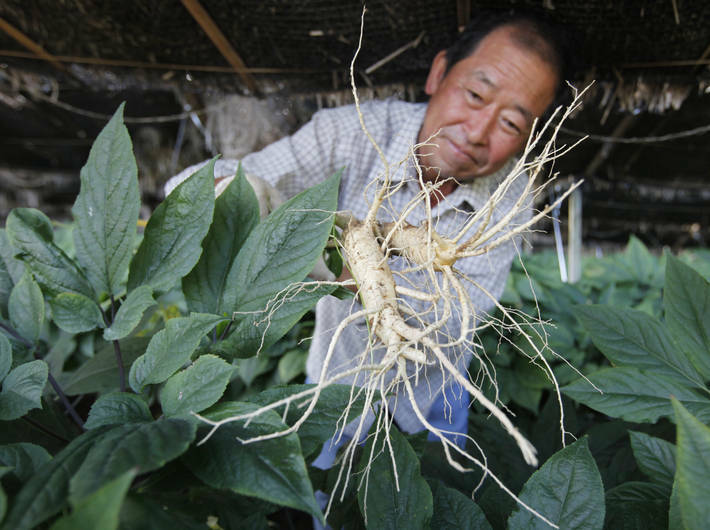 A farmer shows ginseng roots at a farm in Geumsan. The traditional ginseng agricultural system in Geumsan has been added to FAO’s list of Globally Important Agricultural Heritage Systems. The two sites were added during a meeting of the GIAHS Scientific Advisory Group in Rome this week (2-4 July). It is the first time an Italian site has been recognized, and the fourth site in the Republic of Korea. The traditional ginseng agricultural system in Geumsan, South Chungcheong Province has been recognized because it relies on a symbiotic relationship between nature and cultivation, and has been in practice for around 1500 years. Farmers use a 15-to-20 year rotation system whereby land is left fallow or used for other crops after harvest, to allow the land’s ‘energy’ to restore. Surrounding forests and rivers contribute to micro climate control, and shade structures using natural materials help mimic conditions for wild ginseng cultivation. “This is not only about the past, but also about the future,” said FAO’s Yoshihide Endo who coordinates the GIAHS programme. The olive groves on the hillsides in Umbria between Assisi and Spoleto are the first Italian listing on the GIAHS registry. The hillsides between the Italian towns of Assisi and Spoleto (including Assisi, Spello, Foligno, Trevi, Campello sull Clitunno and Spoleto), where olives have been grown since the time of the Etruscans, are now one of the main olive production areas in Umbria and Italy. The area has been recognized for the ingenuity through which natural resources and human needs have been combined to create livelihoods and mutually sustainable ecosystems. Even today, olive groves are cultivated with traditional knowledge and practices including the use of different types of terraces, growing technologies and genetic varieties which have been supported by local communities for many centuries. This area also demonstrates remarkable landscape of olive trees which have been formed by farmers’ long term interaction with nature. The GIAHS register highlights unique ways that rural communities have over generations farmed in harmony with nature to create mutually sustainable livelihoods and ecosystems, and often produced remarkable landscapes in the process.FAO’s selection criteria includes that sites be of global importance, have value as a public good in terms of supporting food and livelihood security, agro-biodiversity, knowledge systems, adapted technologies, and culture, and have outstanding landscapes. Other remarkable landscapes already recognized include Hani rice terraces in China, the Massai pastoral system in Kenya and Tanzania, the Ghout oasis system in Algeria, wasabi production in Japan, Spain’s salt production in Salinas de Añana, Portugal’s agro-sylvo-pastoral system in Barroso, and farmland in Mexico’s Chinampas that relies on oral transmission of traditional farming techniques dating back to the Aztec civilization.